Being just a two and a half hours trip from Vienna, many like to come to the lively Hungarian capital for a weekend. After one year in Vienna it was time for me to visit Budapest myself one weekend in spring. 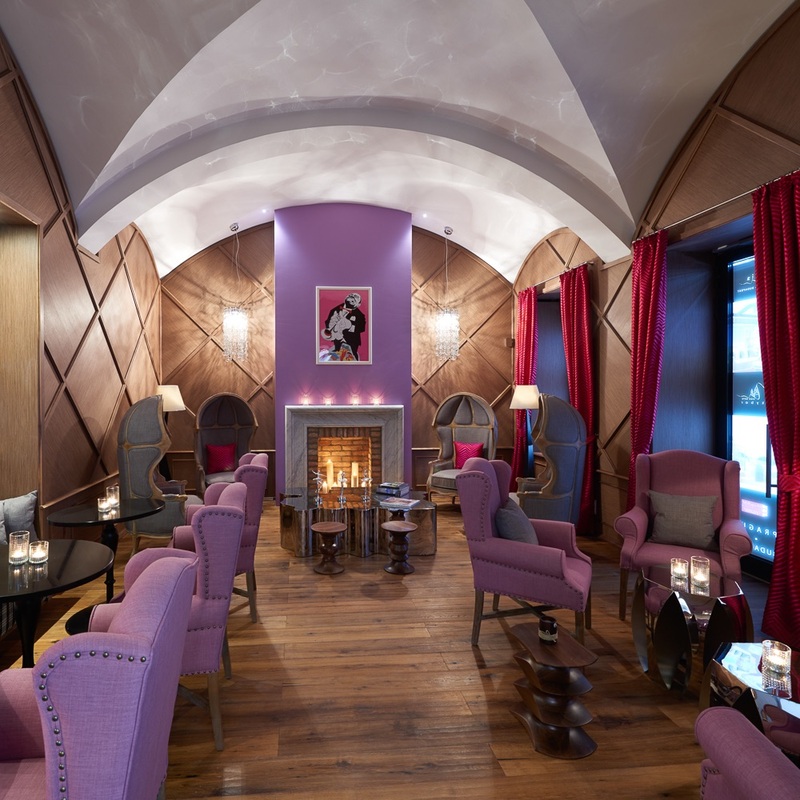 And why not stay at the brand new star of New York Library Collection’s luxurious Budapest boutique hotel Aria? 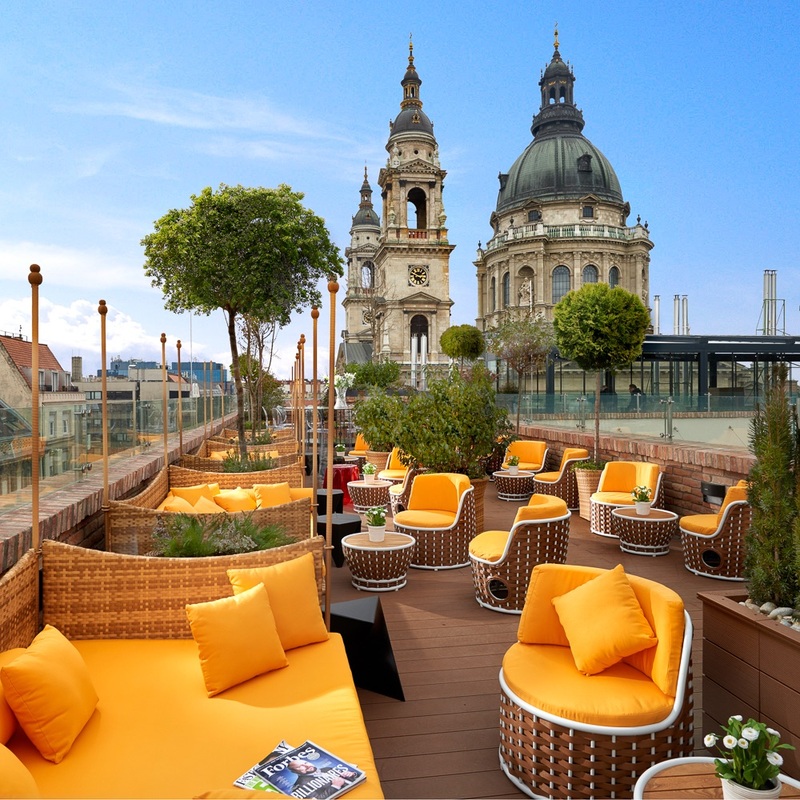 This glamorous hotel is located bang in the heart of the Pest side of the city which I’d call the city center. It is within walking distance of renowned Vaci utca and the high fashion streets. In a few minutes you also reach the Danube for a nice breezy walk and a beautiful view of the citadel and castle on the Buda side. In a buzzing area on a street with limited traffic we found this little pearl that charmed us right away. The airy lobby, originally built as a courtyard, has been turned into a lovely atrium where you can see the blue sky above through a giant glass ceiling. 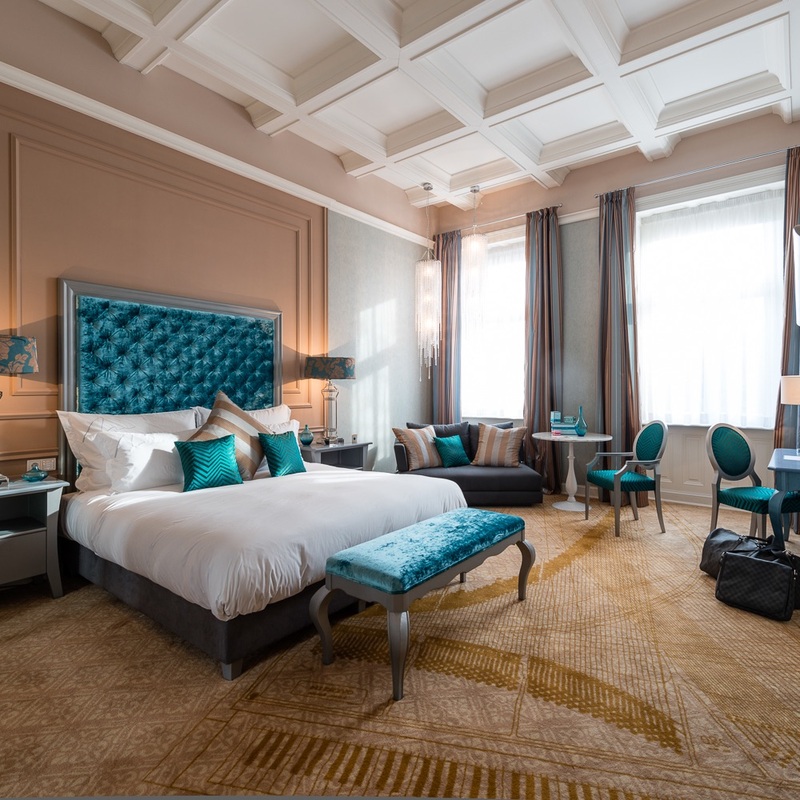 The rooms facing the atrium enjoy the extravagance of a little balcony with comfortable lounge chairs where you may rest from a city tour with a fresh Nespresso prepared in your room. 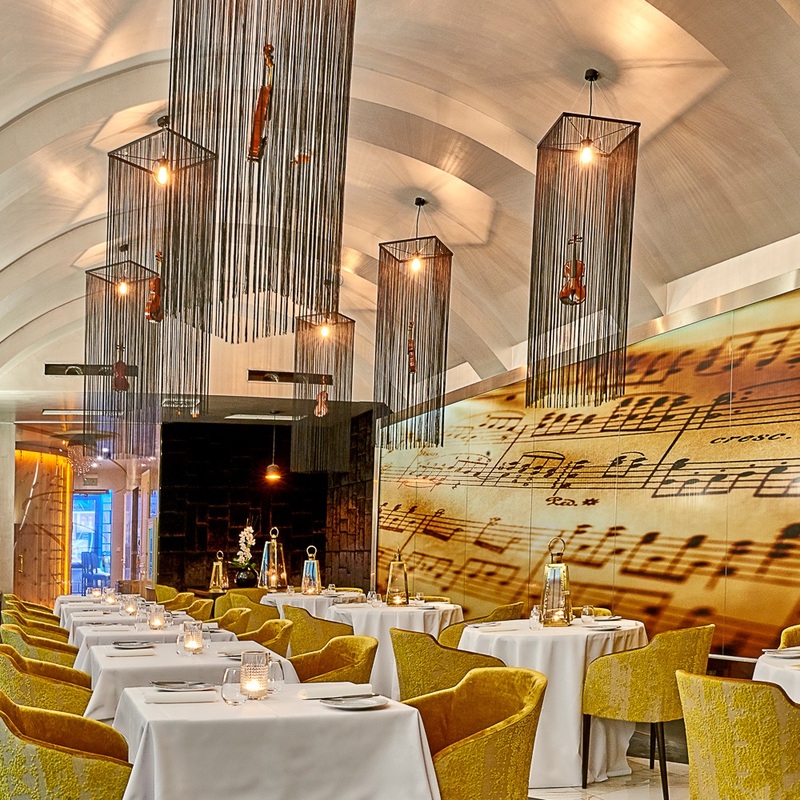 The hotel devotes its overall concept to music which you can see and sense wherever you look and walk. 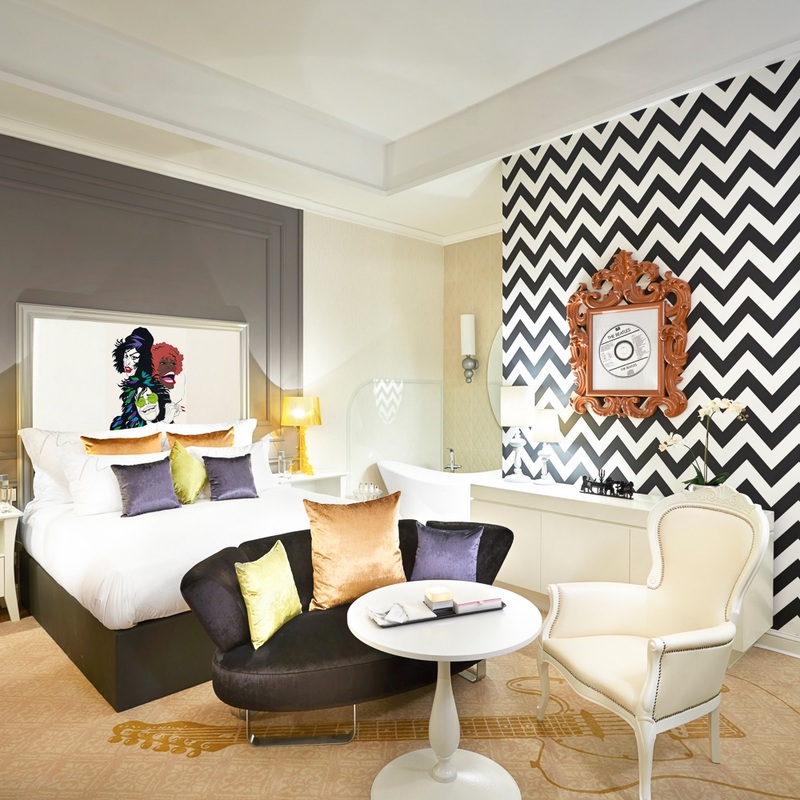 The concierge is called music director, the rooms are celebrating well-known composers and singers. 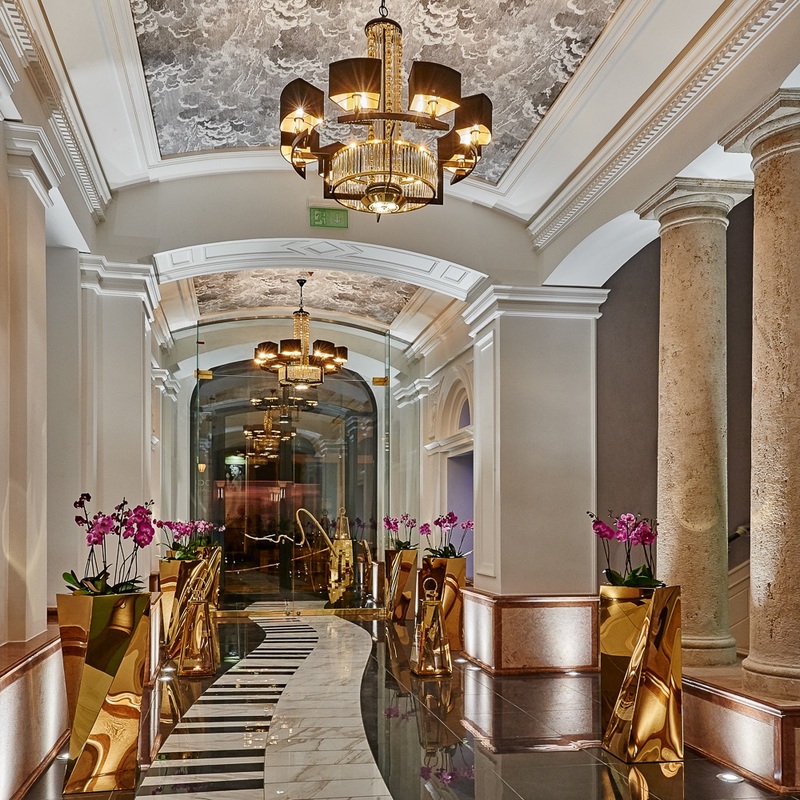 Marble tiles resembling a piano keyboard lead through the hall towards the lobby's centerpiece: a futuristically designed grand piano by a Hungarian manufacturer - just one out of four of its kind. 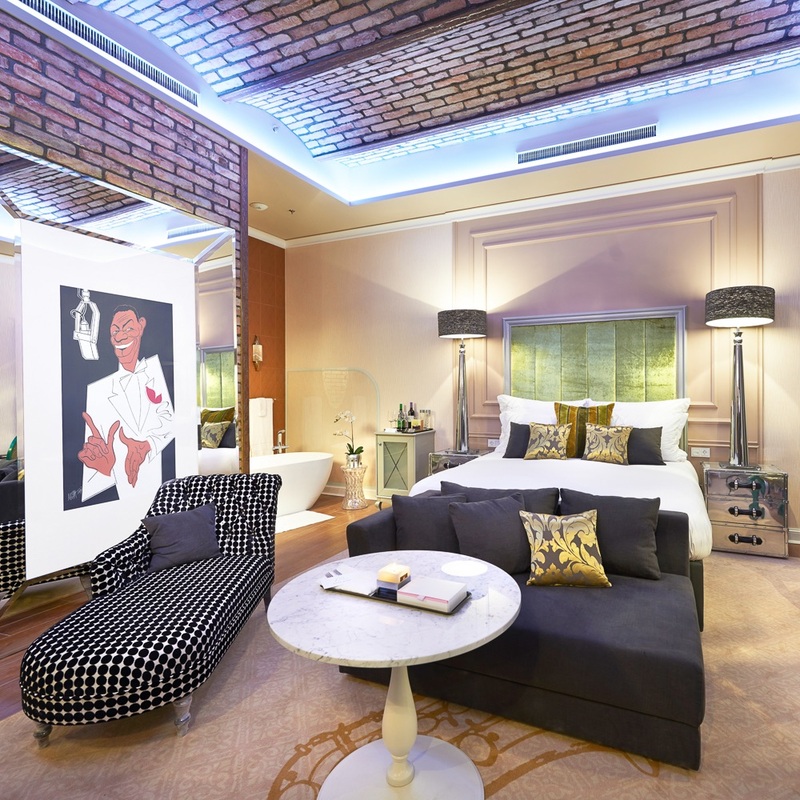 Depending on which wing you are in, your room may be dedicated to classical, opera, contemporary or jazz music, with each wing accessed through its own elevator. 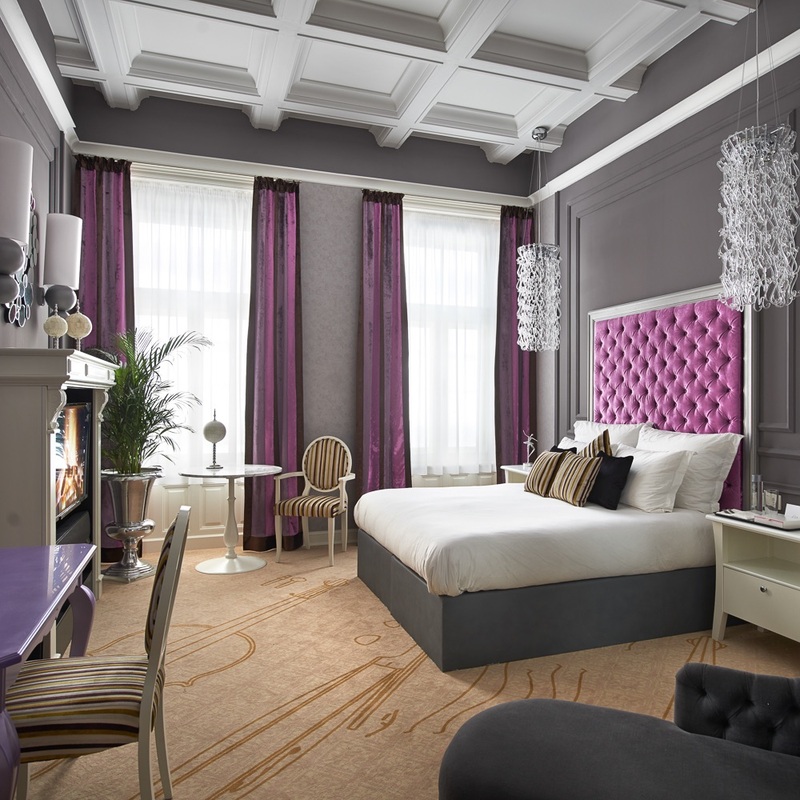 We stayed at a room in the opera wing with purple velvet décor combined with large crystal chandeliers and stark grey as a contrast. Even the orchids came in fitting velvet. You may call this a little kitschy - perhaps it is, yet in such a determined and strict manner that we simply loved it. Honestly, when I woke up in the morning I had a big smile on my face, because I slept extraordinarily well and felt heart-warmed by this eccentric yet tasteful style which really made me feel comfortable. Same did the cosy spa that we enjoyed after a long sightseeing tour. 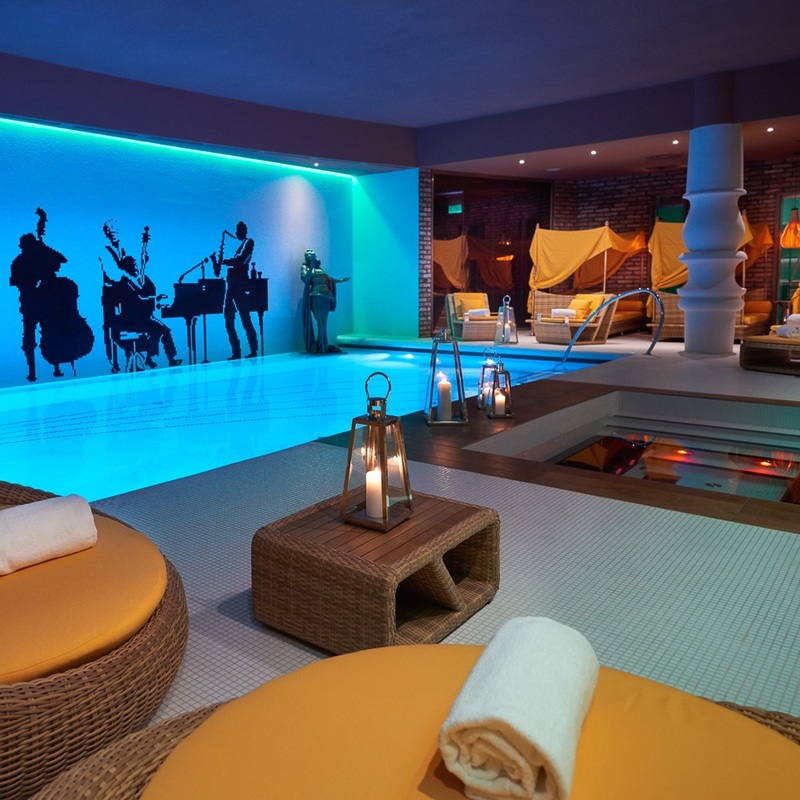 It features, besides a gym, steam bath and sauna, a Jacuzzi as well as a pool with a band playing. At least that’s the image cleverly induced by a glass wall mural of a 'shadow' band and a woman singer sculpture in the front spraying water from time to time. It superbly matches the hotel's overall motto! Another particular highlight was the complimentary afternoon cheese and wine offered by the hotel. 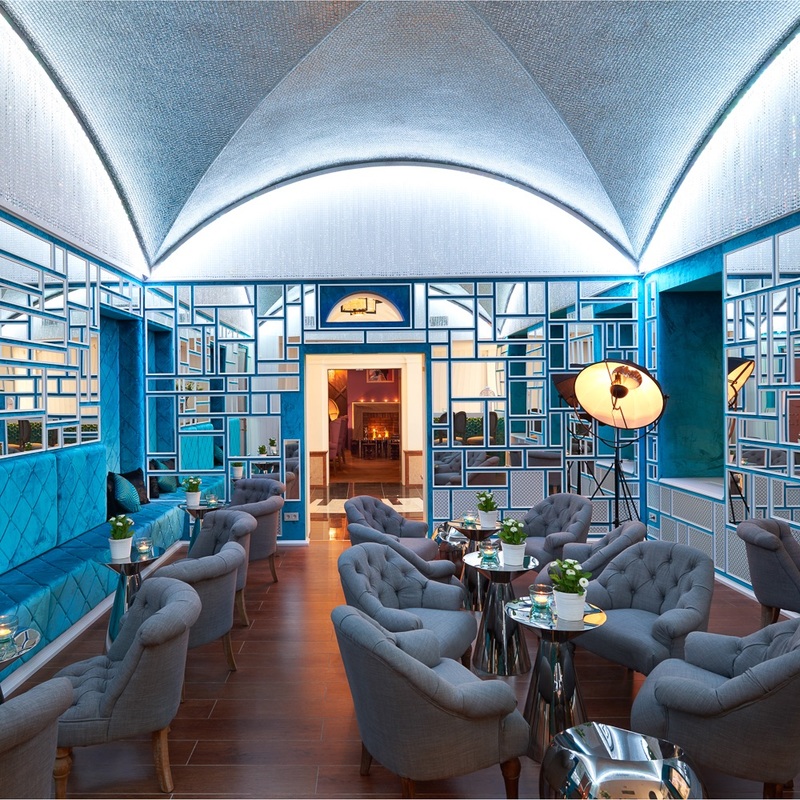 We chose to be served on the roof top terrace which allows a 360 degrees view of the city. Where could one better enjoy a romantic sundowner? This charming little hotel has the potential to make me an addict and I will certainly return soon for another unforgettable stay.